The weekend team scored another victory last night, defeating Deathbringer Saurfang. Grats all. Last edited by Willow on Mon Mar 15, 2010 2:48 pm, edited 1 time in total. 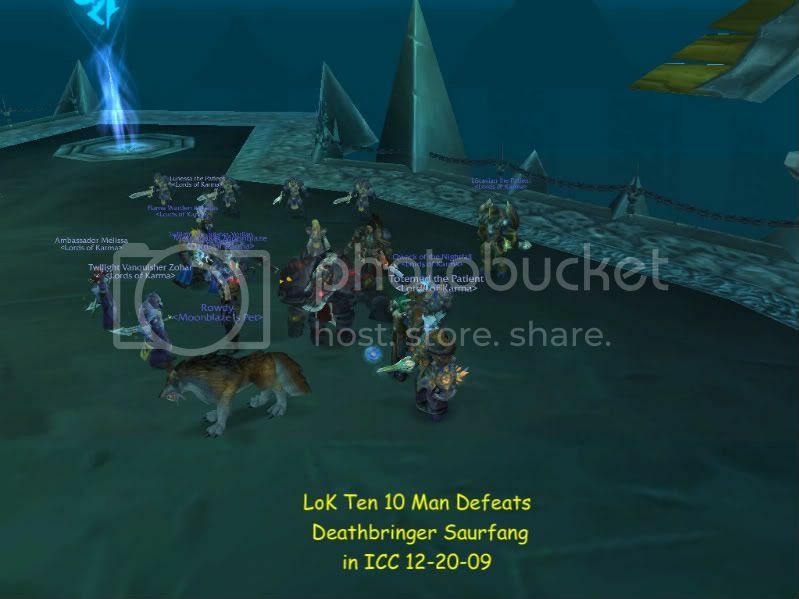 Harvin's 10Man Crew completed the first wing last night (Jan 7/10) and got a couple of attempts in on Rotface before time ran out on us. WooHoo! Grats everyone! Drinks for all! Hopefully our group will get a shot at the new content tomorrow night. Festergut went down today and we had a few good attempts on Rotface had less than an hour on him and had trash respawning on us between wipes, but all and all really good raid. Best of luck to Harvin's team and to Raist's newly formed team! Grats everyone!!!! Good to see that slowly but surely the bosses are coming down!! Well, for some reason it won't let me post an image. I get the message "It was not possible to determine the dimensions of the image". Worked fine the last time I posted one, and it worked just a few day ago when I put some photos on a different forum site. Anyway, grats to Lunessa, Lucavian, Zohar, Qwack, Moonblaze, Melissa, Baore, Benediction, Embrace, and Willow on 10 Man Progression. Good luck to Harvin's and Miaraist's teams. Did you find Festergut to be easier than Rotface? We have only tried Rotface, and I think we are getting the hang of it. Just wondering how Festergut compares. Next week: Dreamwalker and Rotface!